(NOTE: When looking on google maps this unit is the top floor / south east corner). - 2 miles south of "The Pier"
- Recent first class renovation. - Amazing, unobstructed views. - Great location within walking distance to many restaurants and shops. We have lovely showers - but no tub. Sorry! Any closer and you would get spray from the waves! With very comfortable chairs for hours of entertainment watching the waves and wildlife. What a beautiful updated and clean condo! Vicki made our stay comfortable and even had a welcome note with snacks for us upon our arrival! Very convent location, could walk to restaurants and shops! The sunrises were the best, we got up every morning early while on vacation just to see the sunrise from the balcony! Will definitely be back to stay! 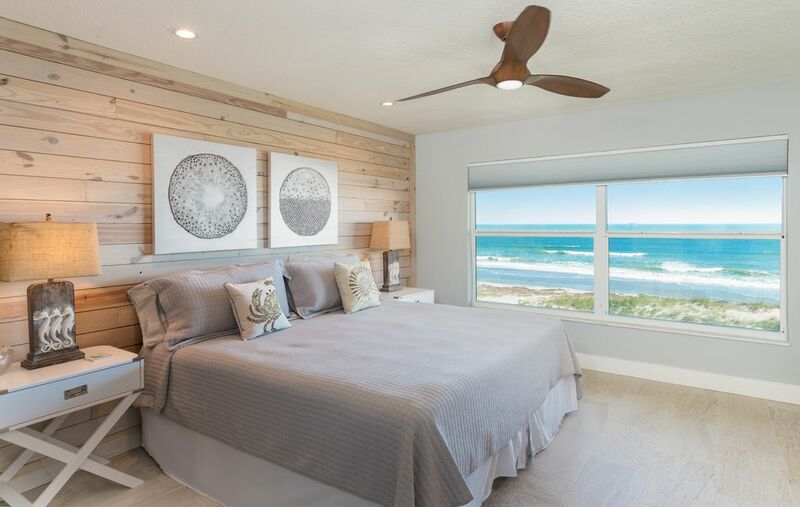 Wake up to the large ocean view at your window and enjoy the modern beachy and tasteful decor/vibe. Comfy beds and linens, bathrooms both updated and the stone detail and fixtures make it more than just another nice place to stay! Don’t want to say too much since I want to come back and it’s booked for the next 4 months!! What a beautiful condo! It is beautifully decorated and well appointed. There were so many nice touches and a lot of attention to detail. Vicki, the property manager, was great and very helpful! Would definitely stay there again! This was the perfect accommodation for our brief stay in Cocoa Beach. We had our two young grandchildren with us for the main purpose of visiting the Kennedy Space Center. Though that was a delightful, informative day at the center, we were also able to enjoy some brief time in the heated pool at the condo complex and a fun time at the beach. We would have liked to have stayed a day or two longer, but since this was a last minute arrangement, we were out of luck. We would definitely return. Cannot think of anything that we needed that wasn’t included in the accommodations. Owners have a beautiful location and furnishings all updated and comfortable. Both the owners and property manager very responsive by email and phone. Top notch in our book! Loved our stay! Every detail was tended too and Vicki was great! We so appreciated being right on the beach - very relaxing. A much need vacation from our fast paced world. Thank you! This condo had everything we needed. It was clean and cozy. It felt like home. The beach here is amazing, great to run, walk, people watch, boogie board and build sand castles. The pool was also warm and my six year old had a great time swimming and meeting other kids. We will be back! Easy walk to stores and restaurants.